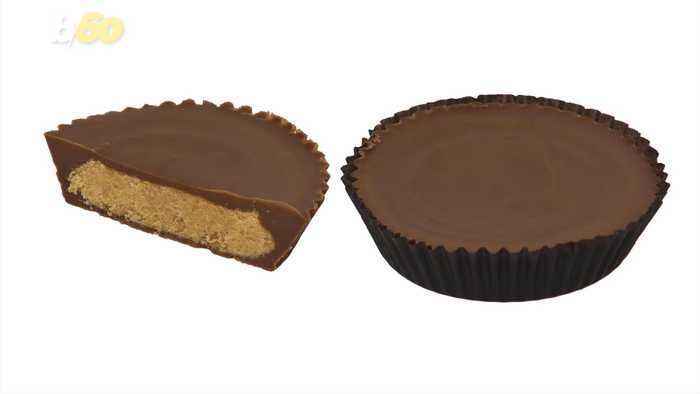 One News Page > News Videos > Why Get Your Valentine's Day Date Flowers AND Candy When the Reese's Bouquet Exists? Candy and flowers are two popular choice for Valentine’s Day presents. But have you ever thought of candy flowers? Candy and flowers are two popular choice for Valentine’s Day presents…???? (vo) 2? ?But have you ever thought of candy flowers? ???? (vo) 3? ?And no, we’re not talking bout edible potpourri.???? (vo) 4? ?Walmart is selling a “Reese’s Extravaganza Bouquet” — which is just what it sounds like — 36 peanut butter cups and what are described as “coordinating orange faux flowers.” ???? (vo) 5/6/7? ?If red roses are romantic and yellow roses mean friendship — what do orange flowers mean????? (vo) 7 cont.? ?Excitement and enthusiasm — according to 1-800-flowers.???? (vo) 8? ?Enthusiasm to share some peanut butter cups, perhaps????? (vo) back to 4? ?And if you think the Reese’s bouquet will save you, it might….???? (vo) 9? ?If you were planning on spending less than $44.99 on your date.???? (vo) 10? ?And to be clear — they’re not marketed as being a Valentine’s Day prezzy.???? (vo) 11/12a-b? ?The occasion is listed as “just because” — though Delish points out similar bouquets made with Twizzlers and Ferrero Rocher, and those are February 14th specific…???? (vo) 13a/b? ?While M&Ms and Kit Kat’s offerings are apparently good for any holiday.???? (vo) 14? ?Wait, my birthday’s a holiday, right?